To the friend who solicits him in this respect, the author tells the story of his life through a series of 14 letters. At the onset just a simple sailor on a commercial vessel, thereafter a slave in Africa and for a while even a slave merchant, miscreant, hothead, he abruptly converted himself when he became aware he had always been accompanied and protected by divine grace. À l’ami qui lui en a fait la demande, l’auteur fait le récit de sa vie en une suite de 14 lettres. D’abord mousse sur un navire de commerce, puis esclave en Afrique, enfin même négrier, mécréant et tête brûlée, il se convertit brusquement après avoir pris conscience d’avoir toujours été accompagné et protégé par la grâce divine. My new master had formerly resided near Cape Mount, but now he settled at the Plantanes, upon the largest of the three islands. It is a low sandy island, about two miles in circumference, and almost covered with palm-trees. We immediately began to build a house, and to enter upon trade. I had now some desire to retrieve my lost time, and to exert diligence in what was before me; and he was a man with whom I might have lived tolerably well, if he had not been soon influenced against me: but he was much under the direction of a black woman, who lived with him as a wife. She was a person of some consequence in her own country, and he owed his first rise to her interest. This woman (I know not for what reason) was strangely prejudiced against me from the first; and what made it still worse for me, was a severe fit of illness, which attacked me very soon, before I had opportunity to show what I could or would do in his service. I was sick when he sailed in a shallop to Rio Nuna, and he left me in her hands. At first I was taken some care of; but as I did not recover very soon, she grew weary, and entirely neglected me. I had sometimes not a little difficulty to procure a draught of cold water when burning with a fever. My bed was a mat spread upon a board or chest, and a log of wood my pillow. When my fever left me and my appetite returned I would gladly have eaten, but there was no one gave unto me. She lived in plenty herself, but hardly allowed me sufficient to sustain life, except now and then, when in the highest good humour, she would send me victuals in her own plate after she had dined; and this (so greatly was my pride humbled) I received with thanks and eagerness, as the most needy beggar does alms. Once, I well remember, I was called to receive this bounty from her own hand ; but being exceedingly weak and feeble, I dropped the plate. Those who live in plenty can hardly conceive how this loss touched me; but she had the cruelty to laugh at my disappointment; and though the table was covered with dishes (for she lived much in the European manner), she refused to give me any more. My distress has been at times so great, as to compel me to go by night, and pull up roots in the plantation (though at the risk of being punished as a thief), which I have eaten raw upon the spot, for fear of discovery. The roots I speak of are very wholesome food when boiled or roasted; but as unfit to be eaten raw in any quantity as a potatoe. The consequence of this diet, which, after the first experiment, I always expected and seldom missed, was the same as if I had taken tartar emetic; so that I have often returned as empty as I went ; yet necessity urged me to repeat the trial several times. I have sometimes been relieved by strangers; nay, even by the slaves in the chain, who have secretly brought me victuals (for they durst not be seen to do it) from their own slender pittance. Next to pressing want, nothing sits harder upon the mind than scorn and contempt ; and of this likewise I had an abundant measure. When I was very slowly recovering, this woman would sometimes pay me a visit, not to pity or relieve, but to insult me. She would call me worthless and indolent, and compel me to walk ; which when I could hardly do, she would set her attendants to mimic my motion, to clap their hands, laugh, throw limes at me; or, if they chose to throw stones (as I think was the case once or twice), they were not rebuked ; but, in general, though all who depended on her favour must join in her treatment, yet, when she was out of sight, I was rather pitied than scorned by the meanest of her slaves. At length my master returned from his voyage. I complained of ill usage; but he could not believe me: and as I did it in her hearing, I fared no better for it. 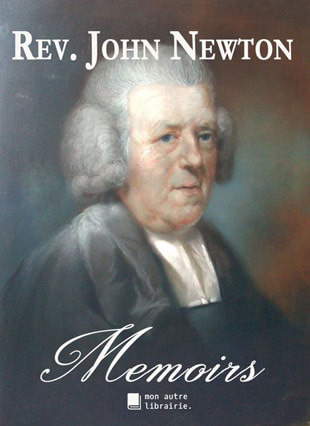 Fils de marin et très tôt orphelin de mère, John Newton suivit son père dans la marine dès l’âge de 11 ans. Son caractère impétueux, son horreur de la discipline, lui rendirent la vie difficile, mais il finit par commander son propre navire et s’engagea dans la traite négrière. Le vernis d’instruction religieuse donné par sa mère avait très tôt été effacé, mais son sauvetage in extremis lors d’une tempête, alors que pour la première fois il avait émis une prière sincère, changea le cours de sa vie. Il se consacra à Dieu et embrassa la carrière ecclésiastique. Journey to Kent—Voyage to Venice, etc. Voyage to Madeira—Entry on board a Guineaman and—Voyage to Africa. Voyage from Cape Lopez for England. Danger, &amp;c. in the Voyage from C. Lopez. Events in Ireland, and Arrival in England. Voyage to Antigua—Return to England and Marriage. Last Voyage to Africa, &amp;c.
Soyez le premier à laisser votre avis sur “Memoirs” Annuler la réponse.